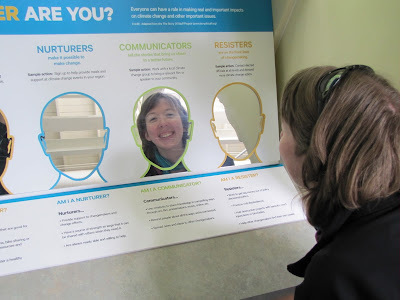 I sat down with Port Townsend Marine Science Center Volunteer Coordinator Amy Johnson to find out what inspires her to Go Blue! We invite you to Go Blue with us next Tuesday, May 3 during GiveBIG. I love walking up through Fort Worden after work, down into the Chinese Gardens and seeing how everything changes from one day to the next. I've been trying to use my camera to look at things in new ways, from different perspectives. Finding new ways of connecting with my surroundings and with people really motivates me. What is your personal relationship with the Salish Sea? I grew up here and I think all my paths coalesce around marine science. It started back in kindergarten. My kindergarten teacher was my favorite teacher. She had some background in marine biology and would bring marine biologists into our class to talk to us about whales. I didn't realize that's where my relationship with the Salish Sea started until I was 22 and dropped a political theory class to take "Marine Diversity and Conservation" and remembered that I had always thought marine science is freaking cool! Any highlights or best memories from studying marine sciences? We did a field trip to Friday Harbor to do some "night-lighting" [also known as "Friday Harbor TV"] where you put a flashlight underwater and see what creatures come up to inspect it. One of the creatures was this crazy iridescent alien folding itself in half and bending and opening and my teacher told me to smell it. It smelled like fake watermelon — I was totally fascinated. What aspect of the Marine Science Center's work resonates with you? For me, our education programs. I am forever a teacher and a learner. I will teach people randomly at the bar about plankton. Inspiration is the first step to conservation, and to be inspired by something, you have to have an awareness of it. So, seeing the students who come through our education programs become aware and inspired by the Salish Sea is the key, for me. Can you tell me about a moment of awe you've experienced on the Salish Sea? I was on a research team measuring Orcas' hormone levels by collecting orca stool samples. We'd follow a pod of Orcas flukeprint to flukeprint, always trying to stay two flukeprints away, looking for this mucousy stuff [the stool] on the surface. At one point, we were suddenly right above them, so we turned our motor off and waited. A huge Chinook Salmon swam under the boat followed directly by an Orca that was hunting it. Seeing the scale of this giant salmon next to the nose of the Orca ... it was this moment of complete awe. I was stunned. That feeling — there are no words. Orcas are incredible, incredible animals. What inspires you to Go Blue? The Salish Sea is an amazing estuary and ecosystem — I can't stress how important it is. I also can't imagine our region without Orcas. When we lost those six in such a short amount of time — one, and then another, and another, I could barely face the idea of losing them. I remember thinking at the time, "what if we can't turn this around?" What Kind of Change Maker are you? I think I'm a Communicator. I like being creative with the way I tell stories: through photography, art, dance, and I love figuring out how to connect all our volunteers with our different programs! connected, and spread news and ideas to other changemakers. Why do you think it's important to Go Blue? By turning your "green actions" [loving and understanding the importance of plankton] into "blue actions" [teaching someone else about the importance of plankton] you might inspire someone else to do a "blue action" too! 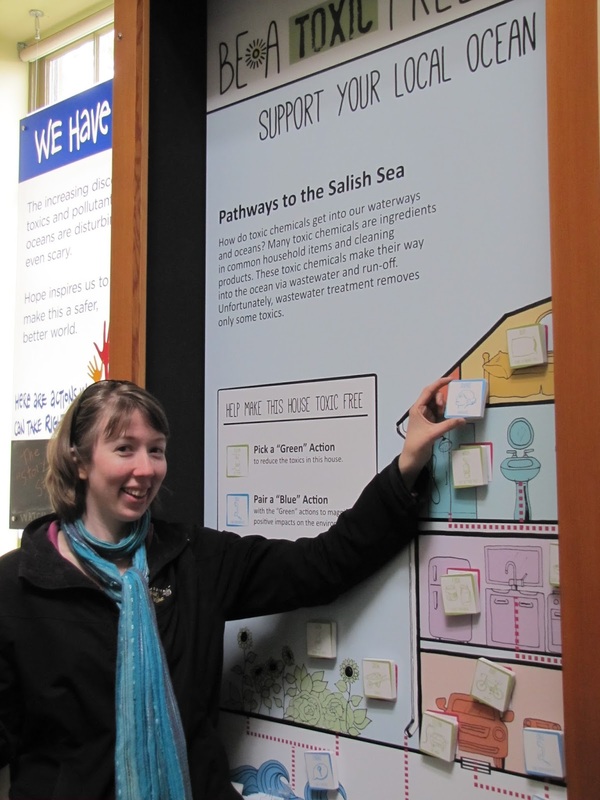 ALISON RILEY is the marketing and development coordinator at the Port Townsend Marine Science Center. Next Tuesday, May 3, the Port Townsend Marine Science Center is trying to raise $15,000 for our mission and programs through GiveBIG, a one-day, online charitable giving event hosted by the Seattle Foundation, but we can't do it without your help! Thanks to a challenge match from a group of local donors, your donation will be matched dollar-for-dollar before being stretched even further by the Seattle Foundation! Schedule your gift today! We Love Our Citizen Scientists!